Biolan inline fan is suitable for the Biolan Eco, Separating dry and Komplet. The fan is DC so it can run off a battery. 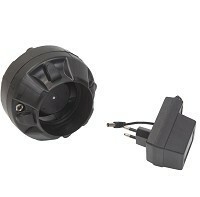 AC power can also be used as the product comes with a transformer. Installation of the fan is advised if the toilet is to be indoors.